I’m old enough that I can remember the original releases of albums that are now marking their 20-year anniversaries. Some of you reading this will no doubt be thinking, ‘Cry me a river, Mr So Deep’. And sure, we all hit that point eventually, but it doesn’t make it any more welcome. I remember Monster coming out. I remember What’s the Frequency, Kenneth, too. I’d liked everything I’d heard by R.E.M. up to that point (the singles off Automatic for the People and Out of Time, plus, I later surmised, Stand, Orange Crush and The One I Love, since I recognised those songs when I first heard Document and Green in their entireties), so I was expecting more of that nice big-hearted acoustic rock music, music that was sometimes whimsical, sometimes solemn, but that pulled off the trick of being emotionally generous without being drippy, and tuneful without being trite. Instead I got a shaven-headed Michael Stipe bouncing around while gabbling a – to me – incomprehensible lyric centred around a repeating question that I couldn’t answer (being 12 and British, I hadn’t heard the Dan Rather story, or of Dan Rather himself) over heavily distorted guitar chords. 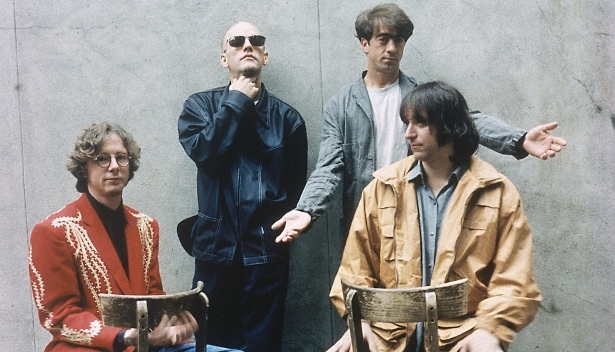 Had R.E.M. gone collectively mad? It seemed a legitimate question to ask. At 12, I hadn’t heard much alternative rock music, and Kenneth seemed harsh and impenetrable. What rock music I’d heard was, I guess, older 1970s stuff (Queen, maybe) or glossy 1980s LA metal. The former tended not to feature great big walls of rhythm guitar, out of which details struggled to make themselves known; the latter kept its distorted guitar tracks under control and never let them tread on the vocals. So Kenneth was initially an alienating and — later, for the same reasons — fascinating artefact to me. It was still recognisably a pop song, with little hooks that got into me and wouldn’t go away (the ‘uh huh’s; Peter Buck’s extreme tremolo guitars in the choruses), but it took time to reveal itself to me; there are still lyrics I’m unsure of. A month later, Oasis’s Cigarettes and Alcohol came out, shortly after that I heard my brother’s copy of Nevermind for the first time and suddenly distorted guitars seemed to be everywhere in my life. This is the result of having been a bit too young when Smells Like Teen Spirit came out – the real era of the loud guitar had been and gone already. My first exposure to the music of Nirvana came when they played a clip from Unplugged on Top of the Pops the week Cobain killed himself, so I hadn’t initially associated Nirvana with heavy rock music. Really. I started playing guitar — rather, I started saving up to buy a guitar — after a friend of mine showed me how to play the Teen Spirit chords. At that point I became a self-defined fan of US rock above and beyond any other kind of music. But earning £11 a week from a paper round, records also had to be saved up for (or scavenged from the library) so what I chose to purchase had to be something I was confident I’d really like. The works of Nirvana first, those of R.E.M. second. I felt I could trust these guys not to let me down. Monster would have been the third R.E.M. album I got my hands on, after Out of Time (for Losing My Religion) and Automatic. Piecing together what biographical info I could, I surmised that the band had been around 10 years or so already and had influenced bands like Nirvana, who in turn seemed to have influenced Monster. Nonetheless, the jump from Find the River to Kenneth seemed big. Monster was an album that took a long time for me to work out. This entry was posted in Music and tagged Automatic for the People, Cigarettes and Alcohol, Dan Rather, Document, Find the River, first guitar, first records, Green, guitars, Kenneth, Losing My Religion, Monster, Nevermind, Nirvana, Oasis, Orange Crush, Out of Time, paper rounds, R.E.M., records that sound strange, Smells Like Teen Spirit, Stand, The One I Love, Top of the Pops, vocals buried in the mix, wall of guitar, What's the Frequency on June 14, 2014 by rossjpalmer.